Those who know me know I don't watch a lot of TV, and there are very few shows I truly cherish. Star Trek: The Next Generation is one of them. 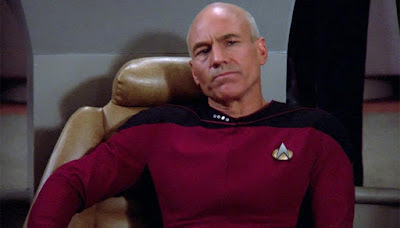 It's the Star Trek I grew up on (I kinda dig Deep Space Nine, too), and Patrick Stewart will forever be Captain Jean-Luc Picard. So today's news has made me smile wider than I have in weeks, because Stewart is coming back to Star Trek in a brand new series. And of course, Stewart had a few thoughts of his own, tweeting that he never thought something like this would happen, but that he's ready to take the Captain's chair again. Make it so!! During these past years, it has been humbling to hear many stories about how The Next Generation brought people comfort, saw them through difficult periods in their lives or how the example of Jean-Luc inspired so many to follow in his footsteps, pursuing science, exploration and leadership. I feel I’m ready to return to him for the same reason — to research and experience what comforting and reforming light he might shine on these often very dark times. I look forward to working with our brilliant creative team as we endeavor to bring a fresh, unexpected and pertinent story to life once more. After starring as Picard from 1987 to 1994, Stewart last played the role in 2002's Star Trek: Nemesis, which was pretty terrible. Of the four Star Trek movies the Next Generation crew were in, it might be the lousiest. Finally I have a reason to subscribe to CBS All Access. For how long will depend whether this new series is an ongoing or a miniseries event.